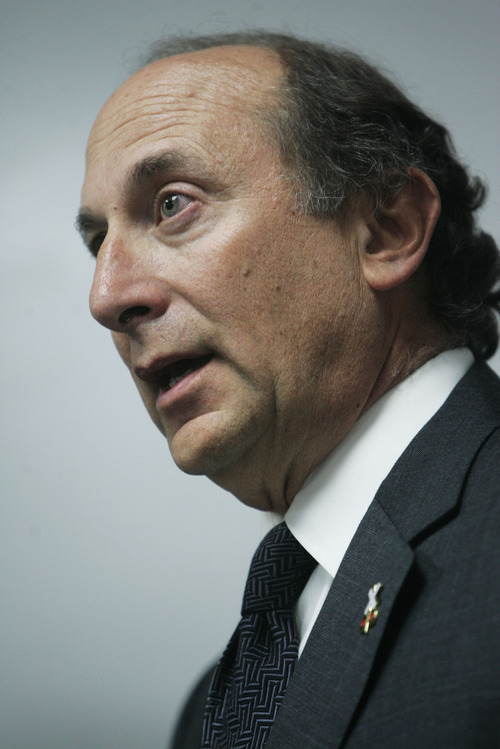 Are UTA execs taking public for a ride with big bonuses? UTA • Payouts aren't reasonable for agency in debt, says state rep.
Steve Griffin | Tribune file photo Bill Tibbitts, associate director of the Crossroads Urban Center, has pushed for fare reductions at UTA. He says the agency goals used to determine executive bonuses seem to be out of whack, and designed to be easy to meet. Tribune file photo Utah Transit Authority General Manager Michael Allegra. Last year, he received the biggest agency bonus for meeting goals set by the board: $25,000. 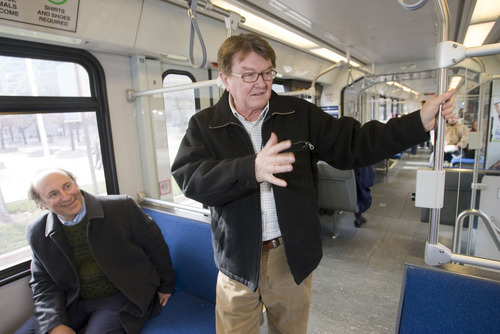 Tribune file photo Former Utah Transit Authority CEO John Inglish. Al Hartmann | Tribune file photo John Inglish, standing, received a $22,700 bonus last year on top of the previous year's $364,000 total compensation for his position as CEO of the Utah Transit Authority. Since leaving the agency in April 2012, he has begun drawing a $200,000 annual pension. UTA General Manager Mike Allegra, seated, received a bonus last year of $25,000. 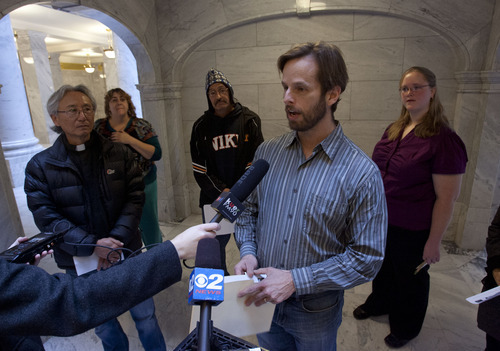 Tribune file photo Citizen watchdog Claire Geddes is outraged that amid a number of questions about Utah's transit agency -- including talk of a possible sales tax increase -- it's top executives are drawing hefty bonus checks. Rick Egan | The Salt Lake Tribune Ercon Yavoz, and Elif Dilsiz, Istanbul Turkey, ride the train to the Salt Lake International Airport on the green line, Thursday, June 13, 2013. 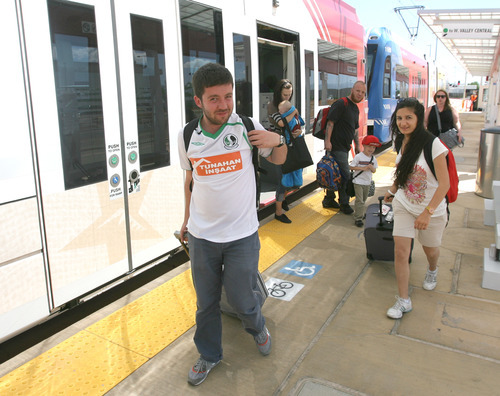 Al Hartmann | The Salt Lake Tribune University of Utah student taps on to ride the TRAX train at University Station Wednesday June 5. 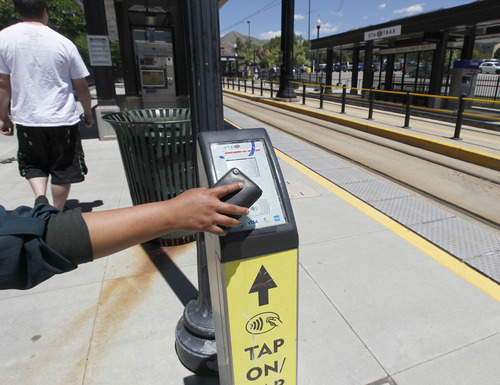 A quarter of UTA pass holders do not "tap off" after they "tap on." It wreaks havoc with planning, because it doesn't allow UTA to gather full data about where people travel. Rick Egan | The Salt Lake Tribune Trax passengers ride the train to the Salt Lake International Airport on the green line, Thursday, June 13, 2013. 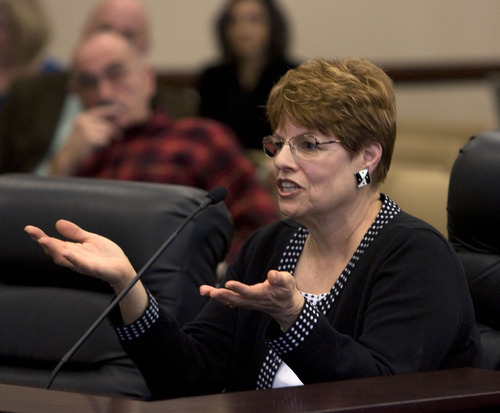 Chris Detrick | Tribune file photo Rep. Janice Fisher, D-West Valley City, questions whether executive bonuses at the Utah Transit Authority are in the public interest. 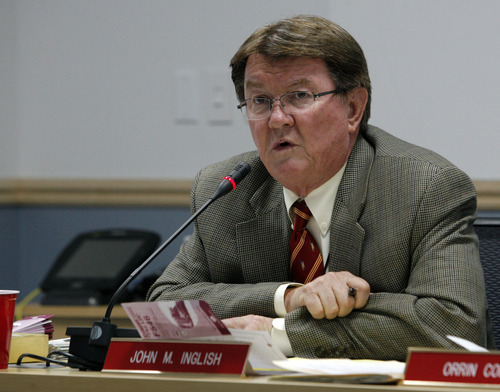 When John Inglish stopped overseeing Utah Transit Authority operations in 2010, a severance deal created his subsequent, mostly advisory job of chief executive officer. That position paid $364,000 total annual compensation as he traveled to represent UTA at industry conferences worldwide for the next two years. On top of a generous salary, UTA quietly paid him a $22,700 bonus last year for 2011 before he formally retired in April 2012, and the CEO post created for him disappeared. That bonus was part of nearly $1 million in incentive awards that UTA paid in 2012, records show. About $750,000 went to executives for UTA hitting goals  which critics say were too easy  set by its board. The rest went to rank-and-file workers as smaller spot awards for good work, long service or fitness incentives. The biggest bonuses of $25,000 each went to UTA General Manager Michael Allegra (on top of his other salary and benefits of $307,604 that year) and UTA General Counsel Bruce Jones (beyond his other wages and benefits of $287,794). In comparison, Utah Gov. Gary Herbert was paid $149,510 in salary and benefits in fiscal 2012, no bonuses included. UTA spokesman Remi Barron said UTA has long given such bonuses "as a way to make the agency operate like a business where performance is valued." State Rep. Janice Fisher, D-West Valley City, who has helped push for legislative audits into UTA operations, questioned the payouts. "I don&apos;t think big bonuses are in the interest of the public or UTA when people are having financial difficulty, and service is being cut," she said. As previously reported by The Salt Lake Tribune, UTA ridership has been essentially flat over the last year despite the investment of hundreds of millions in new rail projects as the agency has scaled back express and other bus service. The agency also has had some other performance challenges. • A legislative audit last year questioned its high level of long-term debt and wondered whether identified revenues are sufficient to sustain such amounts. • And the newspaper and other news outlets have reported that executive compensation at UTA is as much  or more  than transit officials receive in much larger cities. "It&apos;s ridiculous," said Claire Geddes, an activist and longtime critic of UTA, of awarding bonuses in light of such controversies. "You wouldn&apos;t get a bonus for that in the real world. You would get fired. But UTA is in fairy land." 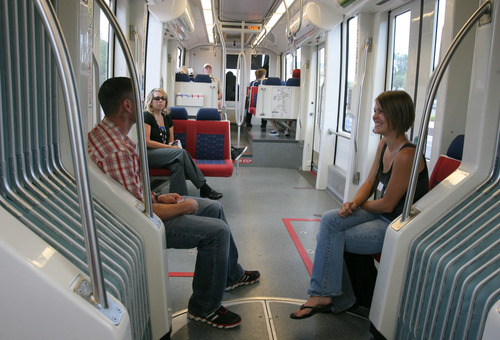 UTA defends the bonus program and says it helped complete four new TRAX extensions and a new FrontRunner line between Salt Lake City and Provo two years early and $300 million under budget. Bonus program • Barron explains how the program works. The 15-member UTA board  appointed by elected officials in cities and counties in the transit district  sets goals for the agency and approved a pool of $750,000 to be split by eligible executives depending on how well those goals were achieved. Eligible employees include "executives, managers, supervisors and a group called strategic professionals, positions that may not manage or supervise people per se but are identified by executives as mission critical," Barron said. "If only 30 percent of the goals were achieved in a given year, only 30 percent of the [bonus] pool is approved for payout. If 100 percent of the goals are achieved, then the full pool is available." 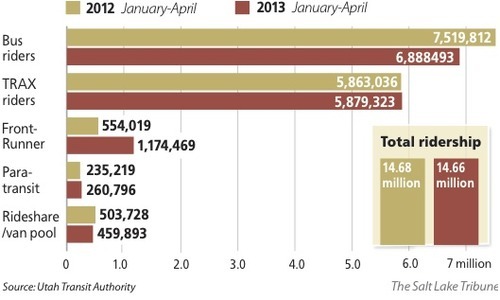 In 2012, the full pool was paid out because UTA hit all its goals in 2011. Each eligible employee&apos;s performance is also ranked by a supervisor on a scale of one to five to help determine how big of a share they have in the bonuses. Records show that just over 200 employees received bonuses last year, which ranged between $25,000 and $1,530 each. • Complete 78 percent of the "Frontlines 2015" expansion of TRAX and FrontRunner lines. (It completed 89 percent). • Achieve $225 million in revenue development. (It brought in $266.5 million). • Cut the "investment per rider"  the subsidy needed beyond what fares pay  to $3.69. (It was reduced to $3.43). • And "maintain a positive ridership growth trend." (It increased 6.4 percent that year). "The incentive program encourages employees to work hard to ensure they meet the board&apos;s goals and be as efficient as possible," Barron said. He said signs that it works included finishing the many rail lines early and under budget and reducing the "investment per rider" subsidy by 9.2 percent between 2009 and 2012 amid "lowered costs and increased farebox recovery." Criticism • But skeptics question whether some of those goals miss the target. "If they are going to give people that kind of money they should give them goals that challenge them a bit more," said Bill Tibbitts, associate director of the Crossroads Urban Center. Tibbitts has criticized UTA fare hikes as unduly hurting the poor, and he dislikes the goal to reduce the subsidy per rider. "That&apos;s basically giving them a bonus for raising prices," instead of alternatively rewarding them specifically for lowering costs per rider. He also takes a jab at the nonspecific goal about increasing ridership, especially in 2011 when UTA was set to open its new West Valley City and South Jordan extensions of TRAX. "You don&apos;t set goals that they are just going to reach anyway." Among goals for 2013 set by the board are increasing ridership by 4 percent over 2012, achieving a $3.52 "investment per rider" subsidy, achieving $22 million in revenue development, and opening new airport and Draper TRAX lines and the Sugar House streetcar line. Geddes reserves perhaps her most scathing criticism for the big bonus to Inglish when he was essentially just representing UTA at conventions. 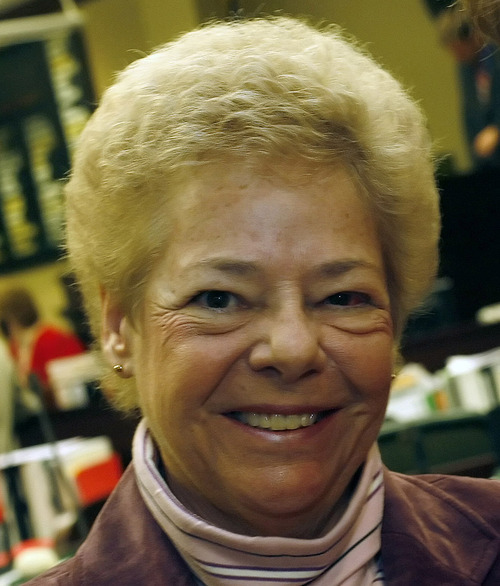 She notes that after retirement, he also received a lifetime pension of $200,000 a year, "which is bigger than most former U.S. presidents receive. There are no words to explain how horrible all this is." Barron, though, said Inglish was doing important work, including "advancing transit initiatives at the national level. He fulfilled his responsibilities and was eligible for an incentive based on his performance in 2011." Special deal • The Tribune previously reported that while serving in the mostly advisory role of CEO, Inglish traveled to Belgium, China, France, Germany, Hong Kong, Italy, Mexico, Spain (twice), Switzerland, Sweden, the United Arab Emirates and 17 U.S. cities. He averaged 1.6 out-of-state trips a month. UTA Board Chairman Greg Hughes at the time explained why Inglish was given such a deal. He said Allegra  as the No. 2 official to Inglish in 2010  was being offered jobs by other transit agencies and the board did not want to lose him as Inglish, then age 64, was nearing retirement. So the board elevated Allegra to Inglish&apos;s general manager spot to keep him, and Inglish&apos;s contract allowed him to draw two year&apos;s salary as severance. Hughes said. Instead of simply taking that, Inglish offered to take the new mostly advisory job of CEO to represent the agency at many international groups and conferences. As UTA and some non-political groups begin pressing the Legislature and local officials for tax increases for transportation  including transit  the bonus system could become another political liability and certainly will if Geddes has anything to say about it.